BURLINGTON, Mass. (CNS) — After the Blizzard of 2013 dumped more than 2 feet of snow on New England Feb. 8 and 9, Catholic parishes in the region were among those facing the challenge of digging out after the storm. That weekend, the Archdiocese of Boston lifted obligations concerning Mass, because of a travel ban in Massachusetts during the storm. “In the event that roadways are not clear for travel on Sunday, the faithful are reminded that the obligation to attend Sunday Mass does not apply when there is grave difficulty in fulfilling this obligation,” a statement from the archdiocese said. Parishes in the Archdiocese of Boston saw heavy snowfall. When the storm cleared, Catholics came out to help their parishes in the aftermath. At St. Malachy’s Parish in Burlington, parishioners brought shovels, brooms, a snowblower — and even a pair of snowshoes to dig out — the afternoon of Feb. 10. “We had a whole bunch of parishioners. Every age, I would say, from about say 50s down to elementary school came and helped shovel the side of the church,” Father John M. Capuci, St. Malachy’s pastor, told The Pilot, Boston’s archdiocesan newspaper. 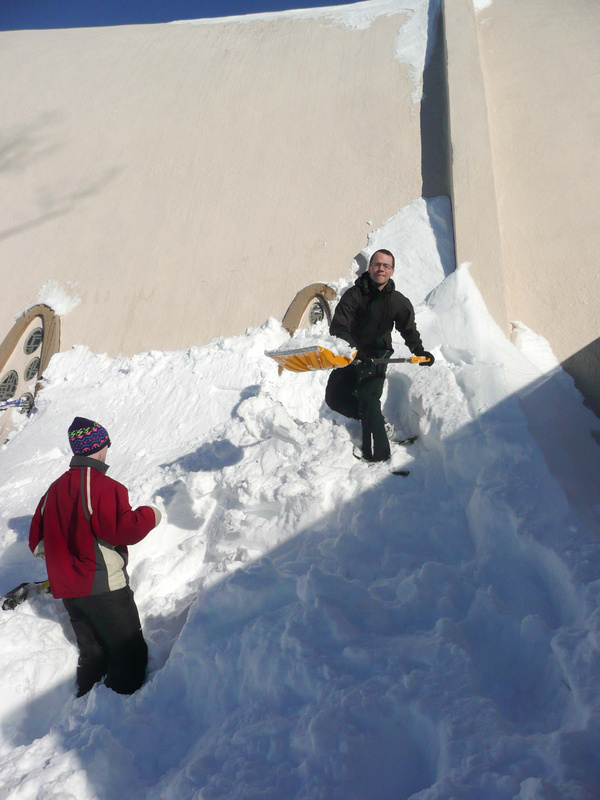 At a Sunday morning Mass, the church announced the need for help removing snow from the building because of the unique shape of the church. “Our entire building is all roof, because we are kind of almost a half-circle kind of building and the snow drifts went up about 9 feet,” he said. Father Capuci said the snow-melt could have damaged the church after recent renovations where the entire structure was coated with multiple layers of paint and protective materials to stop leaks. “We have been in a four-year renovation program here, and I was so afraid that the snow on the building could cause havoc on the work that we have done,” he said. Parishioners who came out to help said they accepted the task as an act of responsibility to the community that makes up the parish. “If this is your parish and you care about it, it’s like your house. You take care of your house, same thing here. This is our house,” said parishioner Mary Beth Arcaro, who came with her two teenage sons to help clear snow from the church. Her sons used shovels and an extendable brush to help their mother remove snow from the church building. “It feels great. This didn’t take a lot of time. It didn’t really take that much effort, but still I helped out my parish and that’s all that matters,” said Philip Arcaro, a freshman at Burlington High School. Walter Zenkin, a Burlington selectmen and parishioner, came to help remove snow also. He said the desire to help each other and the church characterizes the community at the parish. “It’s all teamwork. It’s all working together and supporting your church, and that’s why I’m here, not only for my community, for my church,” he said. Alex Bonnar, 32, even brought his snowshoes, which he used to climb snowdrifts and shovel out church windows. “I saw how deep the snow was this morning at Mass, and thought it might be a good idea. So, I brought them along, put them on, and it worked out,” Bonnar said. “It was better than sinking up to your waist in the snow,” he said. The pastor said he felt pleased to have the help. “It was very heartwarming to see so many beautiful people of different ages, and generations, up there to help shovel,” Father Capuci said.